My weekend was indulgent to say the least! I of course headed to Greensboro to celebrate Mother's Day with the one and only Debs. If you know my mom, you know she's a special lady. Everything I know about cooking I learned from her (well, the Food Network did help a little) and everything she has ever made has been from scratch. I'm famously known for requesting "shiny top" (re: box mix) brownies from my mom like my friends moms made, but fortunately for me, she never obliged! My mom is excellent with classic recipes, but also makes up many of her own so it's of course impossible to replicate, but I do try! My sisters and I took her to one of our favorite spots, Southern Lights, in Greensboro, for Saturday dinner. 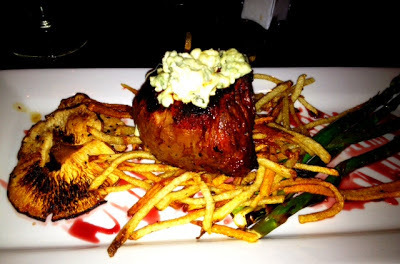 Somehow we all ended up ordering filet mignon, each with our own picky specification! I stuck to the menu offering: filet mignon with bleu cheese crumbles, red wine drizzle and petite pomme frite. Perfection! Sunday morning, my sister Sara whipped up my mom's favorite brunch: classic eggs benedict. Sadly I didn't get a picture - Sara is famous for a great presentation (and a great dish!). After my sisters went home Sunday, my mom and I ventured to P.F. Changs for a quick bowl of soup before we went to the movies. Unfortunately, we didn't anticipate the 2 hour wait! Darn P.F. Changs... We opted to cross the street for a quick bite in the bar at Fleming's and we were so glad we did. 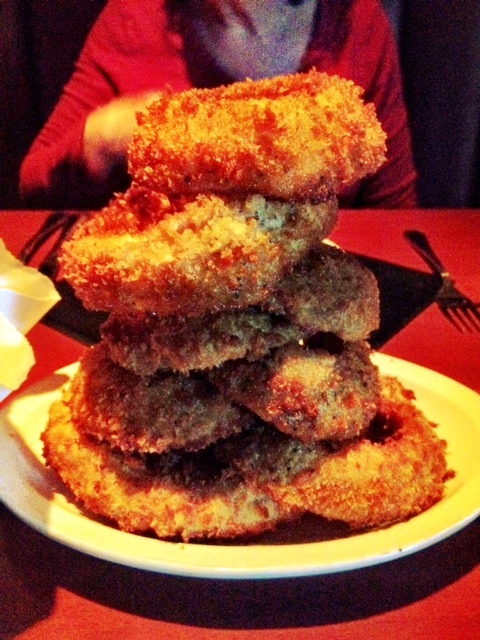 Mom and I obviously split our all-time favorite, the onion ring tower. I adore a good, thick homemade onion ring. Yum! 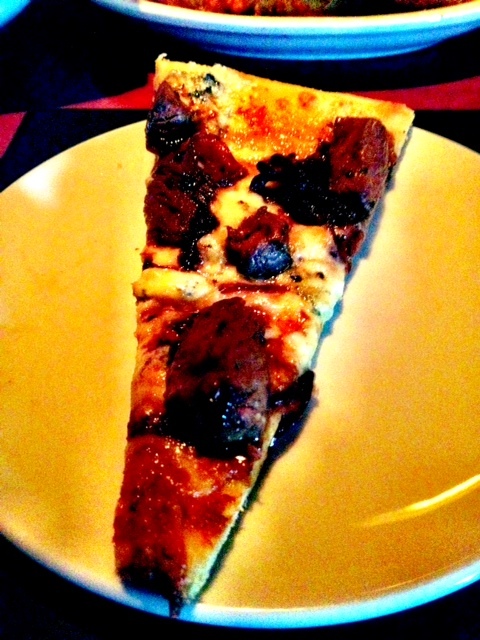 We also split a filet mignon flatbread (is it obvious the Ficken's love some filet?!) It was topped with ooey-gooey monterey jack cheese, a sprinkle of bleu cheese and a caramelized onion sauce. The waitress recommended the Salt & Pepper Shrimp and having no idea what to expect, I was very pleasantly surprised. 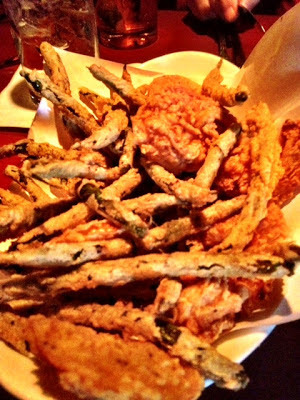 The shrimp, along with green beans, was lightly fried in a crispy breading and perfectly seasoned. I also found myself biting into a fried lemon slice (surprise!) and it was so delicious! Somehow the lemon lost its bitterness in the batter and the contrast of sour lemon with the salty breading was divine. Were three hearty meals in a row enough for this girl? Obviously not. 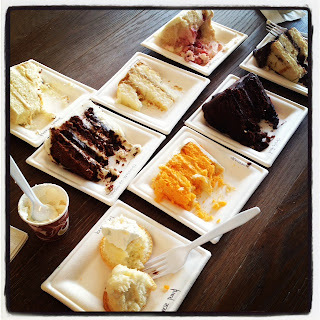 Monday my mom and I went to Maxie-B's to taste test cakes for my wedding cake. What a tough job we had!